China's central bank has issued detailed regulations on expanding cross-border use of the yuan in the China (Fujian) Pilot Free Trade Zone. It will bring more business opportunities to commercial lenders in Fujian province, bankers said. Qi Yun, deputy general-manager of Bank of China Ltd's Xiamen branch, said: "We've been waiting for detailed regulations on cross-border use of the yuan for a long time. "The People's Bank of China did open up certain policies this time. It will bring a lot more business opportunities for banks as well as more financial services and products for individuals and companies in the free trade zone." He said it is not easy for the central bank to make such a step forward at the present stage, considering that the Chinese economy is facing downward pressure. 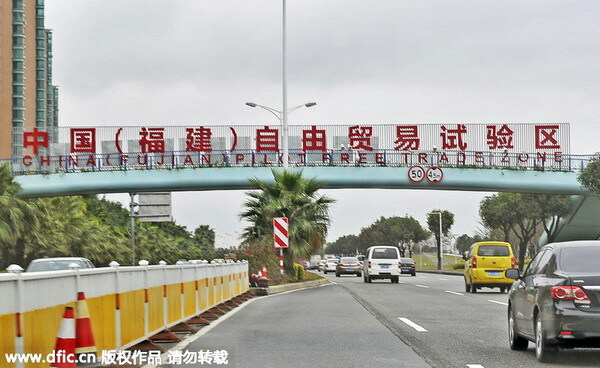 Lian Gengsheng, director of the administration of the Xiamen Area of the Fujian free trade zone, said under the new rules, individuals who work or live in the FTZ will be allowed to make overseas direct investments. A banker who declined to be named said it means that from now on, individuals can make direct investments in overseas companies although the central bank is unlikely to allow them to invest directly in stocks and real estate in another country. The upper limit on overseas direct investments by individuals still remains unknown, according to a notice issued last week to banking institutions by the Xiamen central subbranch of the PBOC, the central bank. Before the new move, cross-border yuan settlement for these individuals was restricted to trade in tangible products and in services. The PBOC will also widen the scope of two-way cross-border yuan cash pooling for multinational corporations by lowering the entry threshold. As a modern instrument of cash management, cash pooling enables companies to centralize liquidity management and optimize interest income. Multinationals are allowed to choose a member of the group that is registered in the Fujian FTZ as the leading company to set up a two-way cross-border yuan cash pool. Members of the group participating in cash pooling must have been operating for more than a year. Previously, a Chinese member of the multinational group that is allowed to join the cash pool was required to post an operating revenue of no less than 1 billion yuan ($154 million) in the previous year, while the minimum requirement for an overseas member was 200 million yuan. But now, both figures are cut in half. Furthermore, the ceiling for cross-border yuan capital net outflows or net inflows is raised from half to the equivalent of the owner's equities of the group's members participating in the cash pool. "Through building a two-way cross-border yuan cash pool, we'll lower the operating costs for the corporations with subsidiaries both in and outside China and will improve the use efficiency of funds," Qi said. Bank of China is looking forward to expanding its business in two-way cross-border yuan cash pooling. After receiving the notice of the central bank, the BOC Xiamen branch opened a cash pool account for a subsidiary of Xiamen Financial Investment Group. The maximum size of the cash pool is 18.5 billion yuan. Yang Zhanpeng, general manager of the BOC Fujian branch, said the branch provided cross-border yuan settlement service worth a total of 276 million yuan for nine companies on Friday. The BOC Pingtan branch at the Fujian FTZ helped two individual clients transferring yuan funds from Taiwan to their personal current accounts with the bank on Monday. The notice also listed several other detailed regulations, including a rule that will allow financial institutions and companies in the Fujian FTZ to use the funds flowing back to China after the money is raised through the issuance of offshore yuan bonds.